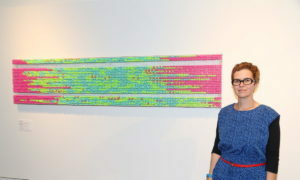 Kent-based artist Linda Simon, whose work is influenced by digital technology and data, had a background in IT before becoming an artist. uvex’s Swedish manufacturing facility sent her the 6,000 earplugs she needed for her work Sleep Patttern without demur. Sleep Pattern – December 2015, was available to view in the exhibition Time at Maidstone Museum until 25 June 2016. Linda, how did you become an artist after being an IT professional? I have always made things, and done traditional crafts such as knitting and crochet. I needed a release from IT when I was working in it, so I started to investigate practical hobbies. I worked with stained glass for two years, but found it a bit too rigid for me. I had never drawn or painted, so I did a part-time course that opened up the whole new world of contemporary art, where I realised you can make art out of anything. Then I did a Fine Art degree and took it from there. My work blurs the boundaries of the digital and physical worlds by creating objects and installations that reference the hidden spaces of the Internet and computer operating systems. As a data collector, I transform abstract numbers into arresting visual patterns using everyday objects. I have an affinity with everyday materials, which I look for and collect. I wait for an idea to emerge, and then use them. I approach each piece through an exploration of the inherent physical qualities and relationship of the object to the subject. The process of constructing the work is often repetitive and time-consuming, in stark contrast to the fast pace of technology. How did you create your work Sleep Pattern? I plotted my sleep, using data collected via a Garmin Vivofit fitness device, between 10pm and 10am for the whole of December last year. I extracted the data and broke it down into five-minute intervals, each of which is depicted using a disposable foam earplug, kindly donated by uvex. I inserted the earplugs into a wire mesh grid, which they fitted perfectly, so that I just had to push them in. Once they had expanded, they held themselves in place. I like to work with materials as naturally as possible. Pink earplugs represent periods of being awake, green ones show periods of light sleep and blue ones depict deep sleep. Each row represents one night of sleep. The gaps within the work have been deliberately left blank to show periods where no data is available, whether through my human error or for technical reasons. What gave you the idea for the piece? I belong to the artist cooperative, Making Art Work and the theme for our annual members’ exhibition was Time. I was just sitting one day uploading the data from my fitness device to my phone. When I examined my sleep patterns in chunks of data it looked like a knitted blanket, so I decided to knit it for the Time exhibition. However, I realised I had always wanted to make a piece out of earplugs, as it is a very unusual material for an artwork. I wear earplugs at night anyway, so I sent off for a multipack of them which contained earplugs with amazing colours and shapes. Sleep and earplugs go together and the idea just popped up. I worked out how to plot the data using them. But when I realised I would need around 6,000 of them, I knew I couldn’t afford to buy that many. How did you get the number of earplugs you needed for your piece? I wrote a proposal and approached several companies selling earplugs to see if any would be willing to donate 6,000 of them to me. Most companies completely ignored me. I contacted 10 to 12 companies until I found uvex’s Clair Weston’s details online and contacted her directly. Clair was very enthusiastic and referred me to Goran Berg at uvex’s earplug manufacturing facility, who was equally keen. I had almost given up hope, and thought I would revert back to my original idea of creating the work in knitting. This happened at the end March – I only had till the beginning of May before the exhibition opened and I was starting to get concerned about timescales. Luckily uvex helped me out. Did you specify the colours you wanted from uvex? No, I couldn’t be that cheeky! I asked for three contrasting colours and explained how I was going to use them. uvex responded very quickly and turned my request round within a week. When I opened the box and saw these amazing colours, it couldn’t have been more perfect, as the plugs are really bright and they are colours that I like and have used in the past. I had seen some beige-like colours online, and I don’t like beige. But uvex’s earplugs were exactly what I’d hoped for and it was quite easy to determine which colours to use for which part of sleep. Pink is the colour used by the fitness device for when I am awake and it felt like it was the liveliest colour. I also thought the colour pink would pop out between the green and blue for those periods between light and deep sleep when I was awake during the night. Blue seemed very appropriate for calm deep sleep. It felt quite natural to use colours that way. What feedback have you had from visitors? The exhibition is going really well and my work has attracted a lot of attention. I’m extremely pleased with how the piece looks and I’ve had lots of very positive feedback – many people had no idea earplugs came in such fantastic colours. Quite a lot of visitors run their hands along the work as they walk past it, as the earplugs invite them to be tactile. The artwork is reasonably robust and none of the plugs have come out yet. I’ve also had feedback on Twitter saying people like it visually and find it interesting, even before they know the story behind it. It is a fascinating object in its own right. How did you like working with uvex? They were great. They have been really responsive and supportive. When I sent the photos through, Goran’s response was extremely enthusiastic. It is nice that I didn’t disappoint them. What about future collaborations with uvex? I’m now thinking about doing a bigger piece and the offer is there if I would like more earplugs for future pieces. I have been playing with the idea of using rug canvas to get an immersive 3D or interactive effect that doesn’t have jagged edges like the wire mesh does. I’d like to make something a person can lie on and interact with. The traditional way artists are able to realise their projects is via funding models and commissions. But this good experience with uvex has opened my eyes to how you can work in other ways. I hadn’t really thought about how the relationship might evolve and it’s nice to think we can continue to work together. It’s also great to realise that there are other ways for artists to get materials for their work than going to the Arts Council and other funding bodies. A lot of other artists have been very interested in what I’ve done and I think that might influence them to also try different ways to get materials for their projects. All in all it has been a very beneficial experience, and I’d like to say a massive thank you to uvex for taking the time to read my request and then act upon it. It doesn’t always happen.